Interviewer: What would you say to someone who finds sitting meditation painful and difficult and they struggle to do it? 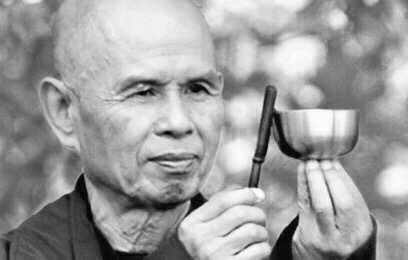 Thich Nhat Hanh: Don’t do it anymore. Thich Nhat Hanh: Yes, yes. If you don’t find it pleasant to sit, don’t sit. You have to learn the correct spirit of sitting. If you make a lot of effort when you sit, you become tense and that creates pain all over your body. Sitting should be pleasant. When you turn on the television in your living room, you can sit for hours without suffering. Yet when you sit for meditation, you suffer. Why? Because you struggle. You want to succeed in your meditation, and so you fight. When you are watching television you don’t fight. You have to learn how to sit without fighting. If you know how to sit like that, sitting is very pleasant. When Nelson Mandela visited France once, a journalist asked him what he liked to do the most. He said that because he was so busy, what he liked to do the most was just to sit and do nothing. Because to sit and to do nothing is a pleasure—you restore yourself. That’s why the Buddha described it as like sitting on a lotus flower. When you’re sitting, you feel light, you feel fresh, you feel free. And if you don’t feel that when you sit, then sitting has become a kind of hard labor. Sometimes if you don’t have enough sleep or you have a cold or something, maybe sitting is not as pleasant as you’d wish. But if you are feeling normal, experiencing the pleasure of sitting is always possible. The problem isn’t to sit or not to sit, but how to sit. How to sit so that you can make the most of it — otherwise you’re wasting your time. Wow! What a coincidence. This is exactly what I needed to read right now 🙂 Thank you!